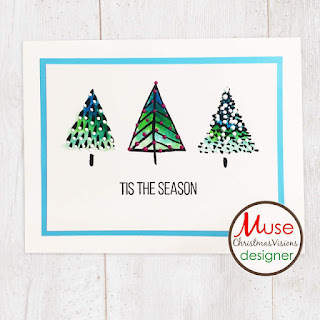 for the next two weeks Kimberly Wiener is going to be your Muse at Muse Christmas Visions. 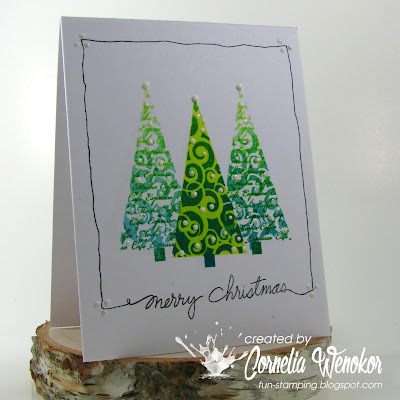 I went with the ombre coloring and 3 trees, which are from So Suzy Stamps (you can find them HERE and HERE). I also masked the center tree and sponged it in a lighter green. The frame I doodled with an Ellen Hutson sentiment nestled in between. Added liquid enamel drops, just like Kimberley. So come and play along! You'll have lots of time, the linky list closes at 7:59 AM EST on Monday, September17th. Very pretty Christmas card. Thanks for joining us at the CHNC Christmas Weekly this week for our "Anything Goes, optional: include the word JOY" Challenge. 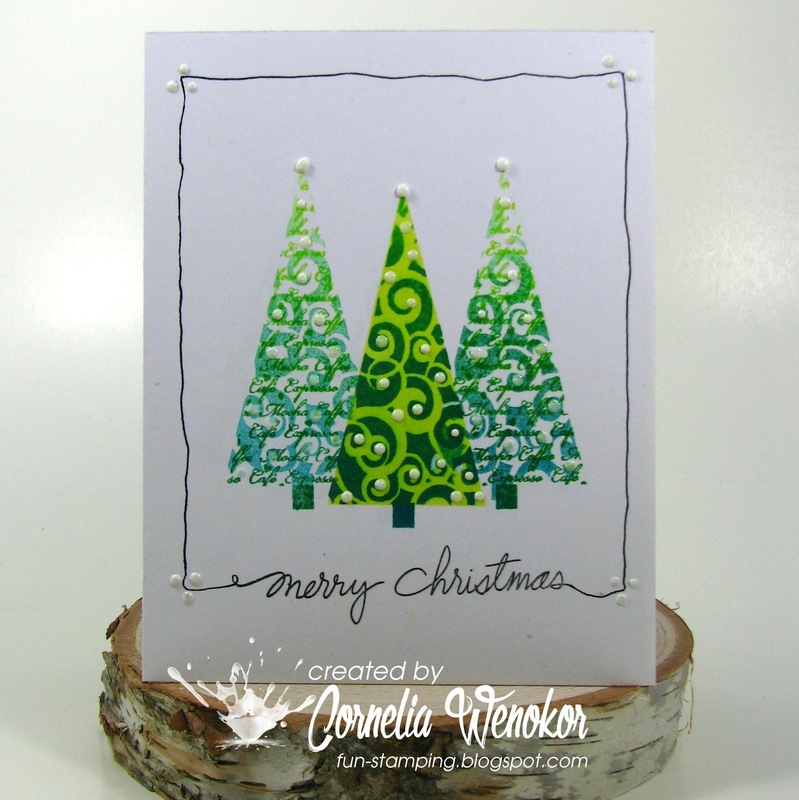 A gorgeous Christmas card design. Great take on the sketch. Great masking and such vibrant and contemporary colours on your modern and wonderful Christmas card x. Very artsy and love the way you nestled the sentiment into the frame. Brilliant. I love the colors, such a beautiful card! Total schön!!! Mein Beitrag kommt diese Woche auch noch. I'd love to walk through a forest of these wonderfully whimsical trees, Cornelia! Soooo festive; so pretty! 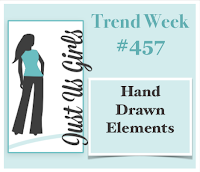 Your hand-drawn frame adds the perfect special touch! Thrilled you shared this in the JUGS gallery! Love the doodling you added to your Christmas trees! Just lovely!! Pretty! Thanks for joining us this week at JUGS! Tying that scripty sentiment into a doodled frame was brilliant, Cornelia. I've pinned for reference. What amazing projects, Cornelia! I love vibrant colors. Great CAS. 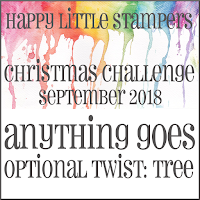 Thank you for joining our challenge at Happy Little Stampers Xmas. 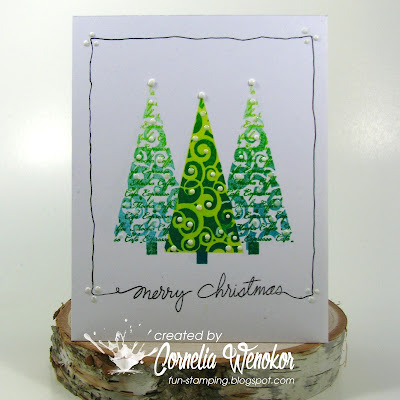 What lovely trees Cornelia, a super Christmas design! Thanks for playing along with Happy Little Stampers this time.